Saturday 17th June National Badger Day. The National Federation of Badger Groups in the UK celebrates Badger Day on the 18th of June. To celebrate this day the IWT will hold a talk on badgers followed by a walk to show people the tracks and signs of these wonderful mammals. Speaker and Guide: Dr Billy Flynn IWT. Time and venue to be decided, notification will be in newspapers/IWT website or call IWT at 01-8602839. The IWT will be assisting both Fingal County Council and Clare County Council on their celebrations of Biodiversity Day. Join in on the days, information can be found on their websites www.fingalcoco and www.clarecoco. If you don’t have access to websites, just ring IWT at 01-8602839 in May. When the poet James Stephens heard a sudden cry of pain, it was from a rabbit in a snare. "Now I hear that cry again/But I cannot tell from where," he wrote. Few animals are even shot for the pot nowadays. But it may surprise some people to know that snares are still in use. Even this very morning, an animal may be horrendously enmeshed in a searing wire trace, struggling futilely to escape. And these snares are being set as part of a scheme carried out by agents of the State, whose wages are being paid by your tax euros. The animals being singled out for a horrible end are badgers. It seems they were always victims. A couple of centuries ago, another poet, John Clare, witnessed the "laughing blackguards" among dogs and men "who go out and track the badger to his den". And "kicked and torn and beaten out he lies and cackles, groans and dies". Today, this unfortunate animal, a protected species (something of a joke, Berne Convention or no), is still suffering horrendously at the hands of man, the "blackguards" now being employed by the Department of Agriculture and Food. This is part of a programme aimed at eradicating tuberculosis in cattle. Over the past decade, about 30,000 badgers have been exterminated in official culls. And TB has not gone away. The badgers are caught in snares placed at their setts or underground colonies and endure unknown suffering before being despatched by gunshot by "badger operatives". From available evidence, the snared animals can spend hours trying to disentangle themselves from devices which have been officially described as "most humane". The Dail was once told that there were "no reports to give rise to concern about these devices". At this time of year, the campaign is at its height. This is the breeding season. The animals are not wandering far from home. But now lactating sows are being caught so the cubs are doomed to starvation in the setts. Badger culling as an essential element in the bovine TB-eradication programme has been complicated and controversial. The official line is that tubercular animals will infect cattle and are a reservoir of the disease. However, badgers may have picked it up from cattle in the first instance, and cattle may continue to infect each other. There are volumes of statistics. One expert opposed to culling said it was based "on voodoo rather than science". Badgerwatch Ireland claims there is no scientific proof of the animal's role in the spread of the disease, despite the "accepted wisdom" of a farming and veterinary lobby. Poor standards of cattle health and welfare spread sickness like lightning. The foot-and-mouth outbreak showed how disease jumped from herd to herd. Intensely farmed cattle become as susceptible to TB as did humans who were badly housed, poorly nourished and stressed in the past. The only way forward is a radical change in animal husbandry practices allied to an anti-TB vaccine. When this comes about, it will be a great day for agriculture, and the persecuted badgers. Not all dairy farms are anti-badger, though. One substantial breeder of disease-free prize animals was proud to show me the badger setts on his land during a farm walk. Badgers are "an enduring lot", as Kenneth Graham's character says in Wind in the Willows, "and so will ever be." According to recent Department of Agriculture figures Badgerwatch understand that a grand total of 53,000 badgers have been ‘taken out’ to date, under licence from the NPWS. 5,171 of this figure were eradicated in 2005. It is anticipated that figures for future years will be considerably higher. The present strategy, unlike its predecessors consists of smaller areas spread throughout parts of the twenty six counties. On the map, each area is defined as a tiny red circle. Each circle represents one sq. kilometre and may if necessary have a buffer zone of 0.5 km. Badgers are removed from circled areas and buffer zones in response to a TB breakdown which cannot be attributed to other causes. The map is updated about every three months as circled areas are cleared and other areas selected. Badgerwatch understands this strategy unlike other culling ‘projects’ may not carry the ‘scientific research’ status. Badgers will continue to be culled in large numbers for the immediate future. It is likely that their numbers could be drastically reduced to half the present population. At this point in time, the fate of the Irish badger depends entirely on the successful outcome of the promised badger vaccine. We pray it may come soon. 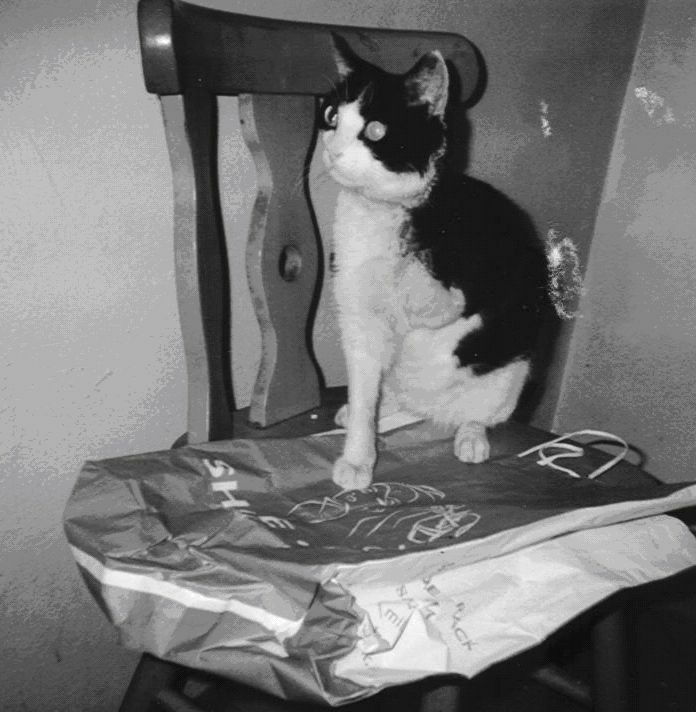 In previous issue of An Broc, our readers were shocked to see the horrendous injuries suffered by a family pet cat ‘Madge’ who was trapped in an illegal snare. Such were her injuries, Madge needed an astonishing 90 stitches to achieve her full recovery. Pictured above is another pet, Sammy, who also belongs to Badgerwatch members, the Cusack Family in County Tipperary. Sammy has also recently fallen victim to a brutal snaring incident. This family has for years been plagued by animal abuser(s) who set illegal snares in the vicinity of their home. The picture tells it all. Sammy has had his left front arm, as far as his shoulder blade amputated. This was the last option. First class care from local vet, Sean and team once more saved the day. Sammy has made a recovery that is nothing short of miraculous. Snares are the scourge of our countryside. Wildlife and domestic animals continue to fall prey. Most suffer horrific injuries and slow agonising deaths. A few are lucky to be saved and nursed back to recovery. Sammy and Madge happen to belong to the latter. Bloodthirsty dog owners scampered and left their animals behind them when they were chased from farmland in Muckalee in North Kilkenny. At least two men with dogs were spotted trying to dig out badgers in the field. The intruders were interrupted by locals who gave chase but the badger-baiters escaped through the fields. They left behind two badly torn animals and a shovel. The terriers has been mauled by a badger in a brutal battle for survival. Fitted to the neck of one of the dogs was a radio transmitter that would be used to monitor the position of the animal after it was forced underground to flush out a badger. One of the battle-scared terriers found struggling already had a facial wound from a previous encounter. Noel O' Donoghue of the Kilkenny branch of the Society for the Prevention of Cruelty to Animals told the "Voice" that the practice would be to put the dogs down into the hole to try to rout the badger. He said foxhunters used the same tactics. He explained that badger baiting is a cruel practice where a dog and a badger are thrown together in a head-to-head fight to the death. "Merciless people would then put bets on who would win, " said Noel. "More often than not the badger would win the brutal battle. It is pure savagery. The badger is protected species, it is a lovely animal and it is illegal to harm it. But even in the cases of foxes it nothing but cruelty to force a fight to the death. Foxes are not protected, they are still considered vermin but they do not deserve to be mutilated either for the enjoyment of cruel hunters." The dogs found at the scene in Muckalee are no being cared for by local vets. "The practice of badger-baiting is particularly disgusting and everything must be done to put a halt to it," Noel O' Donoghue continued. "I am very grateful to the Voice" for publishing the photographs of the wounded dogs which readers will agree are quite pathetic. If anybody recognises the dogs we would appreciate a call to the Society for the Prevention of Cruelty to Animals. Our number is 056-771635. We will then be happy to let Kilkenny gardai deal with the matter. Simple changes in farming practice could stem the spread of tuberculosis in cattle, new research suggests. Writing in the UK scientific journal Biology Letters, researchers say herds on farms with hedges and ungrazed land are less likely to become infected. They suspect hedges keep cattle away from badgers, which carry TB. A government consultation on TB plans ends this week, and the researchers say it is "extraordinary" that ministers should be considering a badger cull. "It is extraordinary based not only on my work but on the evidence they collected," said Dr Fiona Mathews, from the Wildlife Conservation Research Unit at Oxford University. "Their own advisers have put out a report saying a cull could be counter-productive or have limited effects," she told the BBC News website, "and still it's being put forward as an option." The main evidence on culling came from a £35m government-funded study known as the "Krebs Trial". It concluded that culling could be effective if run intensively over large areas; but a less intensive or scattered operation could increase disease spread. Other research has found that cattle movements are the single biggest factor in TB transmission. The new study compares 30 randomly selected British farms that experienced TB outbreaks between 1994 and 1999 against 30 more which were disease-free. Scientists used statistical methods to identify issues which differed between the two groups. Not surprisingly, outbreaks were more likely where cattle on nearby farms had already contracted the disease. But the analysis also threw up several issues of farm management, with hedges being particularly prominent. TB was markedly less likely in farms with abundant hedgerows and ungrazed strips of land along fences; but markedly more likely where hedges had lots of gaps. Dr Mathews calculates that "hedge-poor" farms are 60% more likely than "hedge-rich" ones to experience an outbreak. Why hedges and ungrazed strips of land should lower TB incidence is not clear. It may be that they keep badgers and cattle apart, preventing transmission of bacteria; alternatively it could be that either badgers or cattle living on ecologically managed farms are healthier, raising their immunity. However, Professor Christl Donnelly, a member of the government's Independent Scientific Group on Cattle TB (ISG), cautioned against reading too much into the results. She said the Oxford team had not proven a causal link, just a correlation. "The results are interesting, but the key thing is to realise there aren't any messages about potential disease control options coming out of this study," the Imperial College London researcher told the BBC News website. "Habitat could influence disease transmission; but you wouldn't want to go out now and tell people to grow longer hedgerows." Fiona Mathews agrees that more research is needed - and says the government should pay for it. "We can't demonstrate that if farmers changed farming practices they would bring TB down," she said, "but we can demonstrate there are relationships between farming practice and TB rates, and these deserve further investigation." "They spent millions each year on the Krebs trial," said Dr Mathews. "And we sat in meeting after meeting with them and asked 'what is the Plan B if culling doesn't work?'" She also said Defra blocked access to data gathered since the Krebs trial began - data which could have led to a firmer conclusion. After its consultation period closes on Friday, the government will develop a strategy to address the spread of bovine TB. It now costs Britain about £90m a year, a figure which the National Farmers' Union (NFU) estimates will more than double in the next five years. The government has received more than 10,000 submissions. In December, the government confirmed it was considering a cull among a number of other options. But in January, ISG chairman Sir John Bourne cautioned against culling, say it could lead to an increase in transmission. The RSPCA and other wildlife organisations have been vocal in their opposition, while the NFU is among groups which support the idea in principle. However, it is concerned by reports that the government is considering giving responsibility to farmers and landowners rather than managing the cull itself. A Defra spokesman told the BBC News website: "We will use this [new research] as part of the science base when making a decision on whether to introduce a policy which allows the culling of badgers to control bovine TB in cattle in high incidence areas. "No decisions have yet been made," he added. It was with profound sadness that Badgerwatch learned of the death our friend and member, Paddy Connolly, August 2005. Paddy devoted his life to animal welfare. He particularly loved and cared for wildlife. Badgers were high on his list and he founded the Laois Badgerwatch Group many years ago. He was also a member of the Laois SPCA contributing greatly to ending the needless suffering of thousands of animals. He was supported by his wife Maureen, who sadly died the previous year. 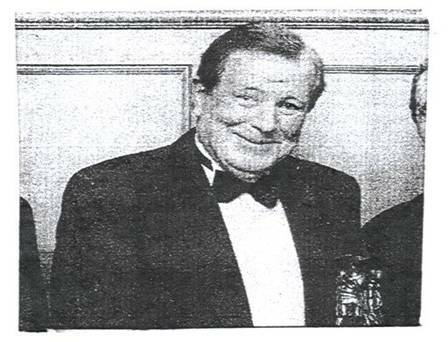 The above picture shows Paddy accepting the trophy for Laois man of the year award in 2001 for his lifetime of commitment to animal welfare. Paddy’s legacy lives on as his daughters, Dympna and Elaine are following in their father’s footsteps, both working with LSPCA. Badgerwatch members extend their belated sympathy to Paddy’s family. Emergence of an Ulster based badger Group. Coillte’s Jenkinstown Woodland is located near the town of Castlecomer, Co. Kilkenny. Coillte is a State owned Company operating in forestry, land based businesses and added-value processing operations. On any ordinary day, Jenkinstown wood is a reasonably peaceful place of tranquillity and a safe haven for our ever diminishing wildlife. 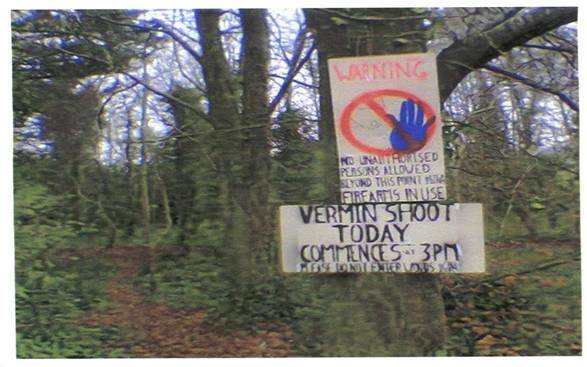 Yet, two days in the year, January 8th and December 26th Coillte allows the local gun clubs to conduct a ‘vermin shoot’ in the woods. The sound of firearms can be heard as our all-too-precious wildlife are systematically blasted out of the world. To many, the fox is a beautiful animal. It has been ill served by man. Crimes have been laid at its door on the scantiest of evidence. Shot by some and hunted with hounds by others, their reasons forever conflicting. The shoot serves no real purpose apart from the joy of killing that it brings to the miniature ‘heroes’ who pursue this activity. It is known that the so-called culling of animals does not work. One well-known environmentalist stated “but the ‘vermin control’ programmes run by gun clubs are based on very bad biology. Attempts to cull mink, magpies or foxes with traps and guns are largely wasted effort. A final proof of this is the fact that in the 1970s and ‘80s there was an international demand for red fox fur and about 35,000 pelts of wild foxes were exported every year. The biologists could not detect any reduction in fox numbers, which remained constant at between 150,000 and 200,000 animals”. People passing Jenkinstown Woods on both of the days in question were bemused by two conflicting signs on the forest entrances, one read ‘wildlife sanctuary’ while the other read ‘Vermin shoot in progress’. It could only happen in Ireland! How very disappointing it was to read in the Kilkenny Voice that Coillte permitted a shoot to go ahead on St Stephen’s Day in woodlands around Jenkintown. In accommodating the gunmen at this location, Coillte not only disregarded their own recreational policy but denied ordinary, decent members of the public the pleasure of visiting these beautiful spots. A few days before the shoot took place, the Irish Council Against Blood sports renewed our appeal to the forestry company to reverse its decision. We argued that closing the property to all but the shooters would be entirely unfair to the majority who enjoy non-destructive activities on Coillte property. The sound of gun-fire, we added, spoils the forest experience for many - particularly those who are aware that some bullets can travel for a mile or more and can dangerously ricochet off trees away from their intended target. We also pointed out to Coillte that the animals referred to as ‘vermin’ are actually integral to the forest ecosystem and should be allowed to live free from persecution. They also part of the attraction of a forest. In its description of Jenkintown park as a tourism site, for example, Coillte proudly lists the fauna which reside there. To many, the sighting of a squirrel, a fox or birds such as owls and pheasants is a thrill: being among undisturbed nature is undoubtedly a significant factor in the decision to travel to a Coillte forest. Allowing shooters to destroy the resident creatures is incompatible with this. The company was also reminded that the area where the shoot was to take place is home to badgers, red squirrels and bats – all protected under the Wildlife Act. Shooting activities not only constitute a disturbance to them but places them at risk of being killed or injured by so-called ‘stray’ bullets. We hope that Coillte will remember that it is a state-owned company whose shareholders are the Irish people. It is outrageous to discommode the majority of these shareholders by allowing trigger-happy destroyers into forests. Hare hunting suspended in Northern Ireland until March 2007. All killing, netting and trade in hares will be banned again from this month (April) until the end of March 2007. This has forced the N.I hare coursing fraternity to travel to the Irish Republic to pursue their activity. The hare population in Northern Ireland is believed to have dropped from 72,000 in 2004 t0 43,700 last year. A special order will be used to introduce a further temporary ban under the Game Preservation Act (NI) 1928. A spokesman for the Department of Environment said: “We consider it appropriate to provide further protection until there is more certainty about the stabilisation and sustainability of the population. The Department will be undertaking a further survey during 2006 in support of the work in recent years to determine the trend in the population.” Last year a report was prepared for the Environment and Heritage Service calculated the density of the animals in N.I. Professor Ian Montgomery of Queen’s University Belfast, was one of those who carried out the study, insisted that hare coursing had no impact. “It has no relevance whatsoever to the population of the Irish hare”, he said. “The major impact is agricultural change.” Hare coursers claimed they were not to blame for the threat to the animal.